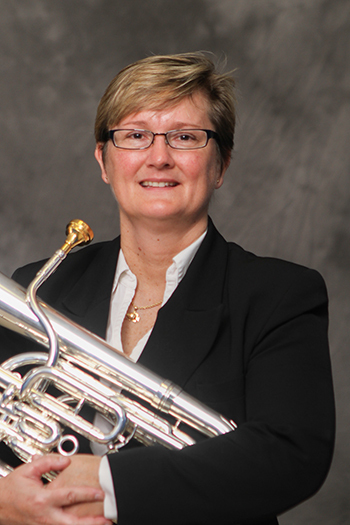 Dr. Gail Robertson serves as Assistant Professor of Tuba and Euphonium/Jazz at the University of Central Arkansas. In addition to teaching, she heads the Jazz area, conducts Jazz Ensemble I, and performs as tubist in the Pinnacle Brass. She earned her B.A. degree from the University of Central Florida and a M.M. in Euphonium Performance from Indiana University while serving as graduate assistant to Harvey Phillips. Gail postponed her doctoral studies at the University of Maryland with Dr. Brian Bowman to perform with the “Tubafours” at Walt Disney World, Orlando where she served as musical supervisor/chief arranger and produced a highly acclaimed CD, “Tubas Under the Boardwalk.” She completed her D.M.A. as a University Distinguished Fellow at Michigan State University studying with Phil Sinder, Ava Ordman, and Ricardo Lorenz. She has taught on the faculties of Eastern Michigan University, the University of Central Florida, Bethune-Cookman University, the University of Florida, and remains active as a teacher, adjudicator, jazz clinician, composer, arranger and free-lance artist, both nationally and internationally. Robertson was elected Vice President/President Elect of the International Tuba and Euphonium Association (ITEA) for a six-year term that began July 1, 2017. She currently serves on the Board of Directors of the Leonard Falcone Tuba and Euphonium Festival. She is Past President of the International Women’s Brass Conference (IWBC) and co-hosted two international conferences (2006, 2010). Gail was Chair/Chief Editor of the International Tuba and Euphonium Press (2012-2017). She also served as Euphonium and Membership Coordinator of the ITEA and was the featured artist on the cover of the ITEA Journal (Vol. 38:1, Fall 2010). Two of Gail’s original works have also been featured Gems in the ITEA Journal (Jazz Encounter No. 1 – Gem Series No. 22, Vol. 38:1, Fall 2010, and Allegro et Andantango – Gem Series No. 33, Vol. 41:3, Spring 2014). In 2015, Gail was Euphonium Clinician for the American Band College in Ashland, Oregon. She was awarded the 2014 Clifford Bevan Award for Excellence in Research for her research manuscript, “Restoring the Euphonium’s Legacy as Cello of the Wind Band.” Her original work for brass quintet, Tower Guard Tribute, was awarded honorable mention by the 2014 International Alliance for Women in Music’s Patsy Lu competition. In May 2009, Gail recorded a CD with Dr. Stacy Baker, Alex Thio, and Dr. Deb Eastwood, called “SymbiosisDuo.” SYMBIOSISDUO released their second CD, “Playground,” in February 2015. Several of the works recorded by the duo were newly commissioned works written especially for the duo, including Composers: Franz Cibulka, Jim Self, James Grant, Christopher Marshall, Brian Balmages, Chris Sharp, Kimberly Archer, T.O. Sterrett, and Phillip Bimstein. In 2016, Gail recorded another CD, The R.S.V.B. Quartet - Fanfare and Flourish, with Dr. Deanna Swoboda, Dr. Stacy Baker, and SFC Lauren Veronie-Curran. This recording includes several of Gail’s original compositions, Okto Flourish, Psychedelic Dances, and In A Funk. Gail is a recipient of Tau Beta Sigma’s highest honor, the “Outstanding Service to Music Award.” Gail has also been a clinician for the MIDWEST Band and Orchestra Clinic in Chicago, the Florida Music Educators Association, the Michigan Music Conference, and numerous ITEA, IWBC, and United States Army Tuba and Euphonium Conferences. Gail recently served as judge for the Dardanelle Jazz Festival and was the state judge for the Florida Solo and Ensemble Festival. She has performed as tenor tubist for the Sarasota Orchestra/Sarasota Ballet performance of Balanchine’s “Stars and Stripes” and as principal euphoniumist in the Blossom Festival Band’s (The Cleveland Orchestra, 2017/2018) “Salute to America” conducted by Loras John Schissel. Dr. Gail Robertson served together with Dr. Stacy Baker as Co-Instrumental Advisor and Co-Curriculum Designer for the Pro-Series Elite Practice Systems for Tuba and Euphonium providing all exercises, instruction, and quartet arrangements as well as performing as on-screen talent alongside some of their students for the revolutionary pedagogical series of 10 DVDs for tuba and 10 DVDs for euphonium. The project was fully funded and released by American Product Group, LLC (2013), along with similar series for each of the wind instruments. Gail has published articles, reviews, and compositions for the online magazine, Bandworld, and the International Tuba Euphonium Association, ITEA Journal. Robertson has toured the U.S., Europe, China, and Japan with Keith Brion’s “New Sousa Band,” the Brass Band of Battle Creek, the Monarch Brass, the Athena Brass Band, and the Brass Band of Central Florida. Gail performed with the Arkansas Symphony Orchestra on tuba and euphonium. She has also performed as a featured soloist at Carnegie Hall with Jay Gephart (Director) and Purdue University’s Wind Ensemble. As tenor tubist/bass trumpet with the Boston Symphony Orchestra, the Detroit Symphony Orchestra, and the Arkansas Symphony. Other ensembles include: River City Brass Band, Jack Daniel’s Silver Cornet Band, Euphoniums Unlimited, Symphonia, and SYMBIOSISDUO. Dr. Robertson and Dr. Baker were honored to be the featured guest artists of the 2017 Leonard Falcone Tuba and Euphonium Festival where they commissioned and premiered Eric Knechtges’ double concerto for wind band, Twin Lake Reflections. Her published works and arrangements are available through GAR MUSIC, Euphonium.com and Tuba-Euphonium Press. As a Willson Euphonium Artist, Robertson’s euphonium of choice is a Willson 2950TA with a bronze Warburton/Gail Robertson mouthpiece.